The opening remarks 'Welcome to Pathfinder' set out the stall: welcoming players old and new to Pathfinder and explaining how this is a streamlined and refined version of the game that has been loved for some ten years, having taken two years of development to get to this, the public playtest stage. It then moves on to more familiar fare with an outline of what roleplaying is all about for those trying it for the first time and explaining what both players and game masters do. This includes a rather patronising section on how gaming should be inclusive - which of course it ought to be! - which presumes to dictate how characters should be played in a manner that is quite uncomfortable to read, ironic as the whole aim is to ensure that the game is comfortable and enjoyable for all participants. Admirable thought, clumsily handled. There's then a fair bit about the stylised conventions of presentation that have been used in this book to make everything as clear as possible. This is of particular use when game mechanics are being explained and ought to help reduce confusion particularly whilst you are still getting to grips with the game. One useful point to get from the outset are the three modes of play: Encounter, Exploration and Downtime. Encounter mode is the most mechanically intense, used for combat and other events where knowing where everyone is and what they are doing round-by-round is important. Exploration mode covers more freeform play and is the real home of roleplaying and interaction, while downtime mode is defined as when characters are not facing any active threats - although it's really the 'between adventures' time when training, trading and other activities may be undertaken, rather than merely being somewhere safe! Die rolling conventions and a glossary of terms rounds out this section. Next up is character creation. It's all been laid out very logically, and with an eye to getting the mechanics to follow your role-playing concept, rather than generating a bunch of stats and then expecting you to work out what that character is like! So it begins by asking "What sort of character do you want to play?" and looking at various aspects: class, ancestry (by which they mean 'race' or 'species'), faith... or even just saying you want him to be strong or charismatic. It's also worth discussing concepts with the rest of the gaming group, including the GM, so that the party falls together naturally and works with whatever the GM has in mind (which can, of course, be modified according to what the party's like!). From this beginning, everything else flows together, apply necessary bonuses and choosing the rest of the things you need to know about your character, ending up with details such as starting equipment, age, and alignment. Following sections then get down in detail over each aspect of character creation, laying out all the options. The section on working out statistics is a bit laboured: even the most inept at arithmetic ought to be able to add a point to a given statistic without a demonstration! The main system presented is purely choice-driven: all stats start at 10, then you apply bonuses or reductions according to the choices you've made about ancestry, class, etc. Traditionalists might prefer the die-rolling option that's presented almost as an afterthought. The next section looks at ancestry. For some reason, if you play a half-orc or a half-elf, the 'other' half is human. It shouldn't be too difficult to manipulate the system if you have other ideas in mind, though. Only humans get regional variations, but every ancestry gets a selection of 'ancestry feats' to choose from. Next up is a series of Backgrounds, reflecting what your character did before becoming an adventurer. It's mostly for flavour, but the odd feat and skill point will come your way as well as appropriate ability boosts. Languages and classes follow in quick succession; and there's plenty to help you play your chosen class to best effect as well as the necessary game mechanics. Following this, skills and feats are presented with complete descriptions and game mechanics, there's an equipment section, and then - of course - spells. Nearly an hundred pages of them to conjure with... and finally we finish the discussion of 'characters' with a section on advancement and options. This includes levelling up and the concept of archetypes. These are a way of explanding the scope of the class you're playing, perhaps by specialising or maybe by combining features of other classes. A discussion on animal companions and familiars is also found here, as well as a listing of the main Golarion deities. Clerics and paladins are required to pick one to venerate, but any character can be religious if they wish. The next section is Playing the Game. It's still addressed to players (although obviously of use to GMs as well) and explains all the rule mechanics you'll need to play the character so lovingly crafted in the previous sections. It begins by running through the various modes of play (encounter, exploration, and downtime) again before looking at the general rules for any kind of task resolution - be it combat, using a skill, resisting a spell, whatever. It all boils down to rolling a d20 and applying the appropriate modifiers, bonuses and penalties, then comparing the result to a difficulty class (DC) which is either set by the GM or is based on another character opposing whatever you are attempting. Everything is explained clearly and in great detail - at times it seems overmuch, like a teacher explaining something at length to a student who doesn't 'get it' straight away; but at least this way there's no room for misunderstanding. This moves on to the results with damage, healing, non-lethal attacks and other such matters being covered. There's a nice scale chart of ranges, useful if you have the need to be really precise about who has been affected by something (especially if you use a grid and miniatures/tokens for combat). There's a bit about perception, mostly based on the idea that asking for a Perception check gives the game away that there's something to be spotted, then we get down to the nuts and bolts of combat in even more detail, very blow-by-blow. It makes it all sound much more complicated than it is. Once everyone gets used to the system, the action flows much more smoothly than it appears here! Exploration mode and downtime mode are also dealt with, but in far less detail - they are generally less complex to handle and, well, who isn't interested in how to fight in an RPG? Finally, we get to Game Mastering. (OK, there's a section on Treasure tucked in afterwards, but...). It begins with a somewhat mixed piece that conflates being a GM in general and the fact that at the moment you're running a playtest. As the notes move on to how you should begin a session, there's a series of suggestions that might work with children but not so much with adult gamers - last time I tried that style of presentation my group reminded me that I wasn't teaching class! The whole tone of this section is slightly patronising and mechanical which dilutes the quality of the advice being given. Understand the processes, internalise them, then let the game flow. You also need to avoid getting bogged down in too much bookkeeping, which will happen if you follow the rules to the letter. Abstraction is your friend here. Notes on adjuticating skills and setting DCs are clear but again get rather prescriptive: remember that the important thing is the plot, and do what furthers the story and makes it fun for all involved rather than get bogged down in precision. What is nice ia a way of determining what happens when the party is not adventuring, even if the whole concept of swapping out a feat for another one is a bit mind-boggling. Learn new stuff, fine, but how does anyone completly lose all ability to do something they used to do well? You can get out of practice, yes, but lose it entirely? Too many restrictions piled around this for it to work other than purely mechanically. Awarding experience is a bit odd: a very granular way of determining how much, but then stating that the amount determined is awarded to the whole party irrespective of how much individual party members contributed to the achievement in question. Think I'll stick to periodically announcing a party level-up in that case, rather than troubling with all the calculations. This work is a good attempt at streamlining the original d20 mechanic, but could improve on the rather patronising tone of presentation. For those who delight in creating diverse characters there as so many options to choose from that it can almost be impossible to decide: but if you work at it you can have just about whatever character you want. However, chose carefully as many options are only available to a given class making it nowhere as 'pick'n'mix' as it could be - espeically as you cannot multiclass any more. Overall a good attempt, but it's still in need of work before it is a finished product. 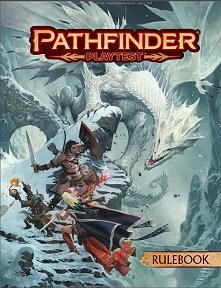 Return to Pathfinder 2e Playtest Rulebook page.